VKN Financial Services (Pty) Ltd plays a critical role in the building of the accountancy profession in South Africa and the global competitiveness of our nation. 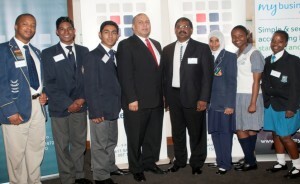 VKN Financial Services (Pty) Ltd has been sponsoring the annual SAIPA National Accounting Olympiad for secondary schools since 2009- an initiative which continues to encourage learners from all over the country to take part in the battle of the minds, as they compete for top prizes, including bursaries. Participants recieve complimentary accountancy study guides which provide them with valuable career and bursary information. On inception in 2002, a mere 153 students entered the competition. A record 11 000 Grade 11 and 12 pupils from approximately 300 schools nationally, took part in the 2009 National Accounting Olympiad! In 2010, SAIPA took a different approach to its National Accounting Olympiad and targeted 702 GDE (Gauteng Department of Education) schools nationally, where 50% of the Grade 12 learners were doing accountancy as a subject. In 2011, SAIPA included an additional stream within the National Accounting Olympiad competition, especially for Dinaledi Schools. The Dinaledi Schools Project was launched by Government in 2001. Currently there are 500 Dinaledi Schools across all nine provinces. Dinaledi Schools were formed to improve participation and performance in Maths and Science, particularly amongst previously disadvantaged learners. Accountancy is a Maths-based subject and VKN Financial Services (Pty) Ltd is in support of this project. Vis Naidoo with SAIPA CEO Shahied Daniels with other winners of the NAO 2013. Following an internal cycle examination, where teachers identify their top five Accounting pupils, who are eligible to participate, the NAO competition consists of two rounds, and each round takes the form of a two-hour examination. The first determines the Regional winners, where the top three pupils in each region progress to the second and final round of the competition. This final round determines the three National winners, in both streams. Winners are announced at a formal National Gala Awards Evening, where the young achievers are acknowledged and applauded by SAIPA and the partners. SAIPA’S intention is to expand their current competition circulation, from 702 to 5 500 schools in the future.